YES is an essential oil supplement that contains your required parent omega-3 and omega-6 fatty acids. YES is listed with a few names, so let's get this done upfront. YES stands for Your Essential Supplements. Sometimes call out by Parent Essential Oils or PEO's. Sometimes as Essential Fatty Acids or EFA's. Sometimes combined to YES Ultimate EFA's. All the same Brian Peskin formula. Whatever you want to call YES as - we have it available in capsules or liquid. What Are Parent Essential Oils? YES Parent Essential Oils are important compounds your body cannot produce on its own. You need to get these essential oils from the foods you eat. Unfortunately, modern food processing turns parent essential oils into derivatives, and these derivatives aren’t nearly as effective at delivering health benefits into our bodies. 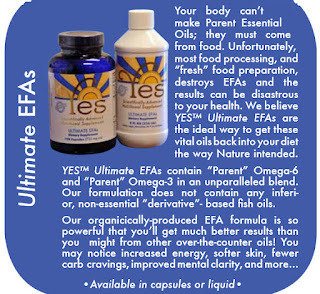 YES created a supplement that has your sufficient daily value of parent omega-6 and parent omega-3 essential oils. AKA parent essential oils. 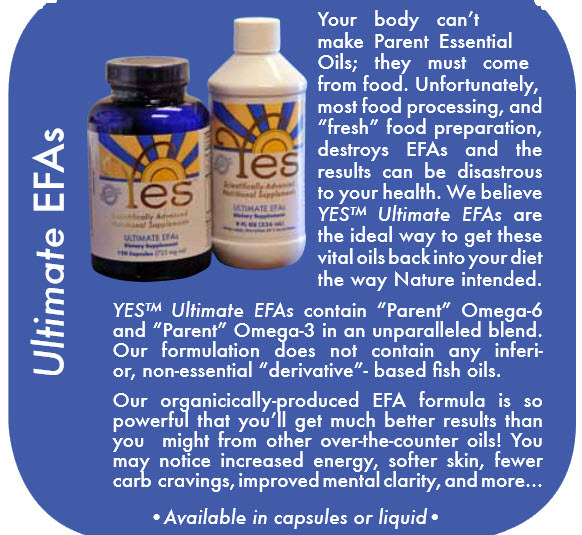 YES Ultimate EFA's has been called the world’s best source of essential fatty acids. YES supplement is made from organic flax seed oil instead of fish oil. YES supplement replaces fish oil. Flax seed oil is far more effective and bio-available than fish oil. Fish oil may contain high levels of mercury and other toxic compounds. Fish oil is generally "over cooked" to remove impurities and form the gel capsule.